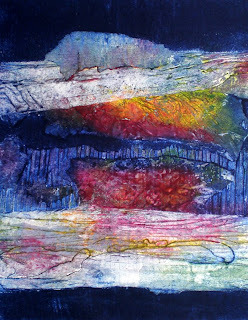 Collagraph Landscape called "Mystery Mountain"
Yesterday I spent in the studio here in Atlanta making a new plate for a collagraph. It was really nice to have the door to my studio/garage open and the sun shining in.while I worked. In case you don't know anything about printmaking, a plate is what you print the image from, and for a collagraph, it is usually a thin piece of board, metal or cardboard that you have collaged or stuck various pieces of paper or other stuff on. You can see some examples at my web site. I spent a long time working on it and was quite pleased at the end of the day, however, when I sat down and reviewed what I had done later that evening, it didn't look good at all! It's so frustrating. I won't give up on it though as there are some really nice parts. I was trying to have some large clear areas instead of all over pattern, but in the end there was just too much space where nothing was happening. I will have to add some more complexity in those areas to make it work better. Above is the photo of "Mystery Mountain" that I did a few weeks back before I went to Toronto. I am quite happy with it but I am not sure about the dark area at the bottom and I am wondering about cropping that part off when I frame it. If you have an opinion please let me know. There are some wonderful color combinations in it when you see it up close. Click on the image to have a look. Oh the joy of printmaking, I love it! This weekend, seems to me, to have been completely wasted. 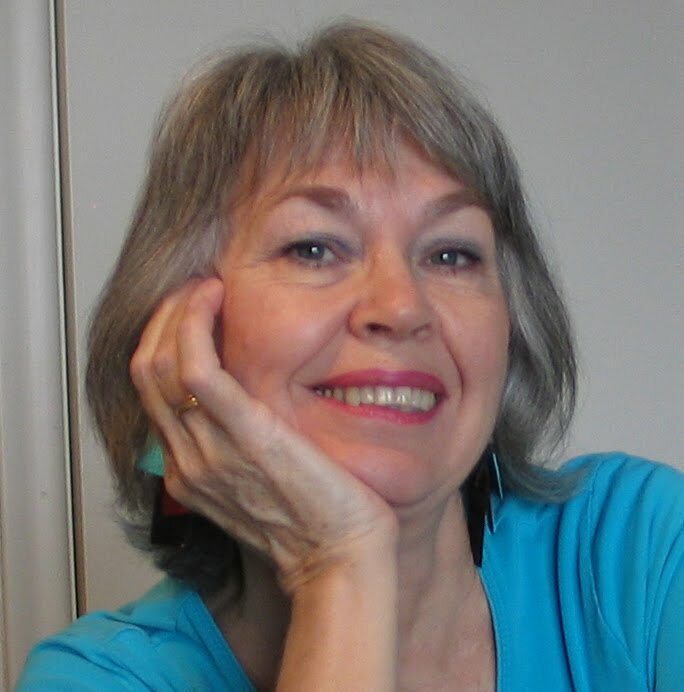 I spent hours on the computer updating things on my web site and trying to set up a paypal system so that I can sell reproductions of some of my paintings online. The web site building program I use is called Homestead and it's really good and easy to use however the thing I find most problematic is sorting out the shipping and taxes. Unfortunately at the level I have in Homestead they don't offer a shipping and taxes option so I have to build all those into the pricing. Entering all the info and pictures in just takes time. Perhaps I was just procrastinating about starting another painting or print! I have run out of steam and enthusiasm for doing a small print to enter in BIMPE. I find small really hard to do. I think I will go back to bigger things! One thing I did achieve this week was making a submission to an exhibition coming up that is focused on Music, and I donated a couple of paintings for a charity fundraiser here in Dunwoody. Yesterday was quite exciting for me. After several months in preparation I finally recieved a box of CDs on which my musical painting, Fractured Cello, is the cover artwork. 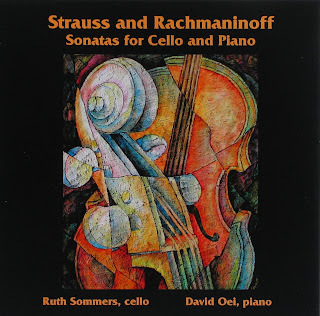 The 'Strauss and Rachmaninoff Sonatas for Cello and Piano' feature Ruth Sommers, cello, and David Oei on piano. Both are musicians with Festival Chamber Music (FCM) in New York city. The other thing that happened was that I picked up a copy of Access Atlanta a weekly arts insert in the Atlanta Journal where my large wacky collagraph 'All You Need is Love' was printed very large in color! I was away when the paper came out but Cathy at Heaven Blue Rose Gallery in Roswell where my prints are exhibited had kept me a copy. Last night when I went up to the gallery to pick up the paper the amazing 'Alive After Five' event was on. Canton St has a group of galleries and lots of restaurants who all get together to make the monthly events a real swinging affair. There were two bands playing and the street was filled with people eating, walking and shopping. Very impressive and worth visiting if you live in the Atlanta area. Just make sure to get there early if you want a place to park and eat. Details of dates are on the Gallery website. In the Studio Again. 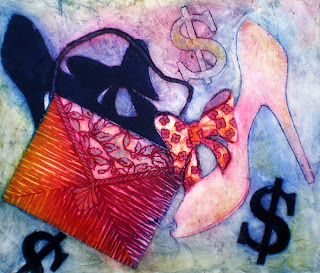 New Collagraph Print called "Purse and Pumps"
We have just spent the past two weeks on holiday in Toronto helping to build a kitchen and doing lots of painting and cleaning. for our middle son and his partner. His Dad and I along with his partner's step Dad worked non stop for the two weeks and I have to say that it is going to be fantastic. It's a great feeling to see something come together so well after all the work. We now need another holiday to recover. It's good to be back and in the studio again and creating some new collagraph prints. My printing press arrived just a few days before I left and I only had time to play with it a bit before going to Toronto. I had been looking forward to using all the fabulous ink colours and experimenting! Today I started work on some small, 4 x 6 inch collagraphs to enter in BIMPE, the Biennial International Print Exhibition held in Vancouver. It is a real challenge for me to work so small but challenges are good and can lead to exciting new work, well that is what I am hoping happens. I will post pictures of the results, meanwhile here is a picture of my first attempt done prior to going away. It's a pretty girly artwork called 'Purse and Pumps'.